The group's after-tax profit was up to VND 5,622 billion, the highest level ever. Masan Group Joint Stock Company (MSN stock code) has just announced that it has exceeded the growth target of the first year in the next 5-year plan. Accordingly, enterprises reported 2018 after-tax profit of VND 5,622 billion, of which VND 3,478 billion was net profit after tax allocated to shareholders. Profit margin exceeded 322 points, equivalent to 9.1%. In particular, Masan Consumer Holdings (MCH code) led the group's growth, with revenue up 28.2% compared to 2017. The Group's consolidated income index before interest and tax (Ebitda) exceeded 11.6% to VND 10,482 billion compared to VND 9,396 billion in 2017. Consolidated Ebitda reached 27.4%, increased by 247 points compared to the same period in 2017. "This is just the beginning. Our core strategy is starting a strong momentum in the next few years," said Nguyen Dang Quang, Chairman and CEO of Masan Group. In the past year, Masan Nutri-Science (MNS code) introduced to Hanoi market the MeatDeli brand that applies European technology and TCVN12429-1: 2018 about cool meat. This is a step to help businesses complete the value chain of 3F (from farm to table) and become a consumer goods company. To implement this strategy, Masan Consumer will step up its premiumization strategy by expanding its portfolio of high-end products, expecting to generate 20% growth each year. In 2018, sales from high-end seasoning products grew by about 40%, contributing 10% of total industry revenue. Revenue from high-end products in the convenience food industry surpassed 50%, contributing 40% of the revenue of the industry. 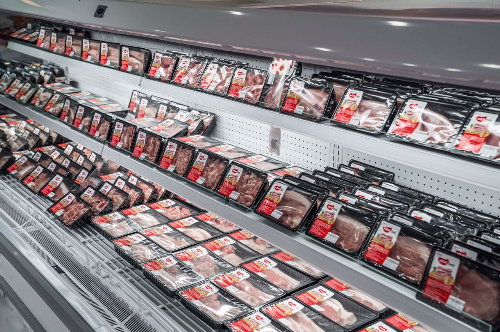 With the launch of the fresh meat brand MeatDeli, Masan Nutri-Science aims to be the leader in the $ 10.2 billion pork market, with high growth opportunities with the margins of consumer goods. . The company plans to expand distribution channels to reach 5-10% of Hanoi's market share by the end of 2019. MNS's feed market is also forecast to grow by 10-15% in 2019. MeatDeli meat stall at the supermarket. Masan Resources (MSR code) will continue to invest in high technology to become a high-tech producer of tungsten and industrial metals. In the past year, the company recorded net revenue exceeding 27% compared to 2017. After acquiring 49% of the capital contribution of HCStarck at Tungsten Nui Phoi Co., Ltd. (now Masan Tungsten Co., Ltd.), The performance of MSR has been significantly improved, reflected in the fourth quarter of 2018. The company is investing to increase the capacity of tungsten industrial chemical factory to 12,000 tons, making it one of the largest tungsten industrial chemical producers in the world. Techcombank alone (TCB code) will continue to focus on serving the financial life of 100 million Vietnamese, maximizing the source of fee income through banking and financial services. The bank has reported pre-tax profit of VND 10,661 billion, up 33% compared to 2017. "Masan's strategic goal is to satisfy the maximum daily necessities of Vietnamese consumers. We are always consistent with that goal and will achieve it," Mr. Quang said.